The combined forces of the U.S. military continue to be involved in the longest conflict in American history. This has put an enormous strain on service members and their loved ones. In 2016 tens of thousands of our service members will be returning home. We intend to be there for them. 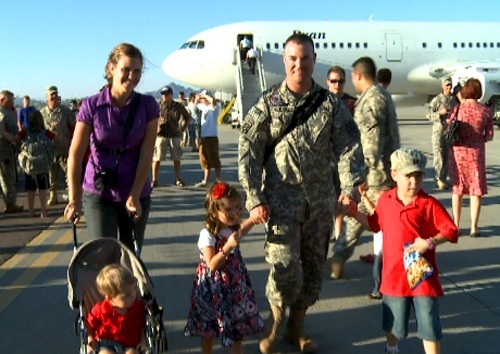 Always a welcome sight, our troops returning home to their families. For them and for those who have already returned, there’s a great deal of healing that needs to be done and we need to bring this extraordinary and time-proven production directly to them – to their base, their community, to them. Letters From the Front gives them a chance to reflect on the duty, honor, and selfless sacrifice made by those on the battle front and home front for nearly 240 years, and to give them an opportunity to put it into personal perspective. It does that, and so much more . . . 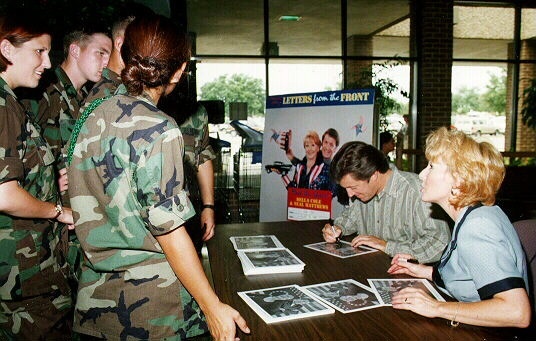 Letters From the Front stars Bobbi Kravis and Bob Curren meet with troops at Ft. Lee, VA after a performance and distribute free letter writing kits. For 15 years Letters From The Front entertained hundreds of thousands of American troops, their families and Veterans on military bases in the states and around the world. 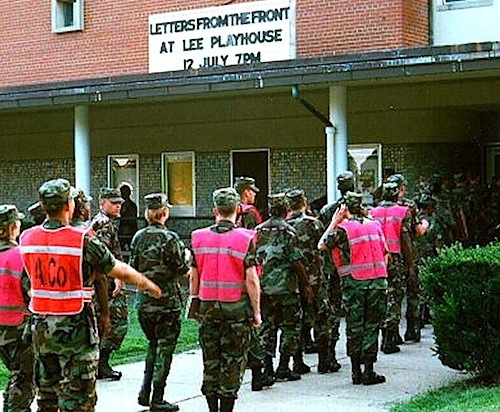 It was the first professional theatrical production to perform at the Pentagon and has received so many commendations that it has become known as The World’s Most Decorated Play. 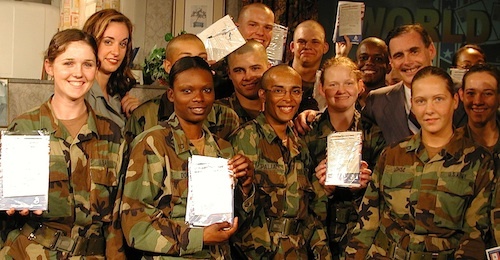 The original version of Letters From the Front took place during Desert Storm, but in 1999 the story shifted to WWII to give it broader appeal. Same characters, same plot, different times. The photos seen on this blog reflect the different eras. Now for the first time the script for Letters From The Front is available to the general public in Kindle and print editions. It has been put in book form and formatted for easy reading by general audiences (as opposed to theatrical professionals). For more information go to this blog page. Click here to read the 5-star review. THERE HAS NEVER BEEN A SHOW LIKE LETTERS FROM THE FRONT. Why did it become so beloved by the military community? What makes it so unique? Actual war correspondence written by soldiers and their loved ones throughout American history are interwoven into a story that takes place on the home front and honestly reflects the personal themes found in the letters themselves. It’s about the commitment to preserve freedom, from Vally Forge to now. Curtain call at Ft. Leonard Wood and another thunderous standing-O. What more could a theater troupe ask for? The story takes place during the closing days of WWII in Europe. The setting is the New London, CT home of Katharine Hartgrove, a writer of national acclaim. She is also a war mom. Her son Stuart is serving with the 5th Army in the bloody fighting in Northern Italy. Even though the main action of Letters From the Front is set on the home front during WWII, the play starts in 1965 as an elderly Katharine Hartgrove writes a letter to her grandson who has just been deployed to Vietnam. Katharine explains how she never really shared what those times were like and as she begins to tell him about it, the magic of theater takes us back in time to when she was a war mom working nights in a submarine plant in Groton, CT. She is a renowned writer of human interest stories and has been commissioned to create a play based on letters written during war times. She asks her boyfriend, Johnny Chastain, America’s favorite radio funnyman, to help. He provides an unforeseen twist to the story, but also comic relief throughout the play. 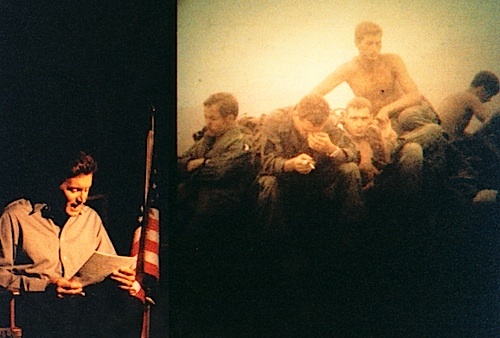 The Vietnam War connection is strong, particularly during Act II when the actors read letters from all American conflicts. Behind them, visuals fill a large screen, accompanied by a moving musical score. 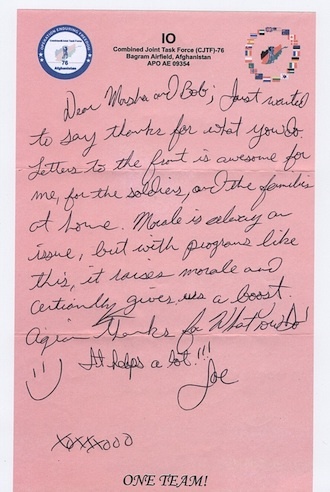 Several letters are from the Vietnam era, including the famous one from Dusty, an Army nurse serving in SE Asia. At the end of the play, Katharine concludes her letter to her grandson. ~ A play?! That’s like being forced to eat boiled broccoli! But, ten minutes into the show, they’re laughing, applauding, and cheering! Why? ~ They identify with Katharine. She’s like their moms and expresses the same concern over their welfare. For a couple of hours she becomes their surrogate mother and they love her for it. ~ Johnny’s wise guy antics crack them up and when his character takes an unexpected turn, they are very moved. ~ Most importantly, the young troops quickly realize this is a play about them and about those who went before them. It’s their story. And no one has told their story before quite like Letters From The Front. The fact is that it doesn’t matter how high tech a war is, what individual people experience doesn’t change. At the end of the show these young service members jump to their feet and applaud with enthusiastic appreciation! The cast and crew of Letters From the Front makes an effort to get involved in the activities of each military community they visit. Personal appearances are made at the local commissary or other facilities. We’ve helped sort mail, observed training exercises in the field, shared MREs with the troops, and attended many community activities from 4th of July cookouts to air shows. 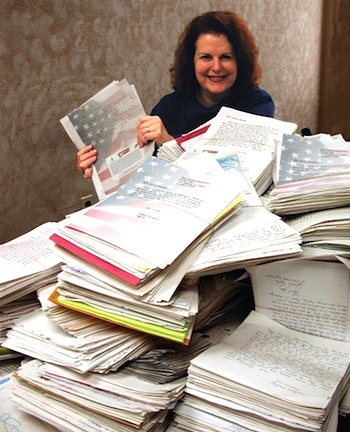 We also developed, promoted, and implemented the Letters TO the Front letter writing contest which generated hundreds of thousands of hand-written letters to our troops serving overseas. 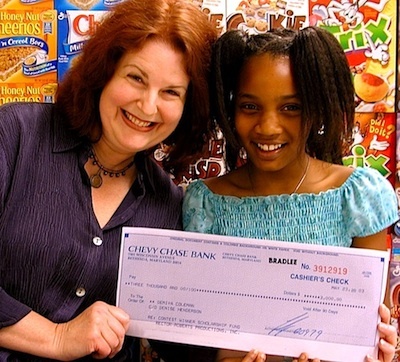 The letters all started with, “Dear Service Member, I just wanted to say thanks for . . .” The contest was divided into three age categories and the winners received scholarship funds or a computer. 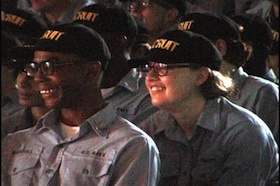 “The young service members learn a great deal by watching this. They look up to the people who made it possible for us to do what we do today. This is a great story for them, and it adds a personal touch. It’s not just the rah-rah war part, but it’s what the effect is on the families back home looking at the brave men and women that have gone forth and fought wars for us.” – MG Thomas Braaten, Commanding Officer, MCAS Cherry Point, NC. “It’s a well-produced show with an important message. It’s a powerful portrayal of emotions of both service members and their families over the course of our nation’s history. I can tell you without reservation that this live theater is an important opportunity to reach out to local civilian communities, and enhance our connection with mainstream America.” – Col. Mike Stewart, Installation Commander, Ft. Meade, MD. “Provides perspective and healing.” – Commander Renata Louie, US Navy Commanding Officer, NSA LaMaddalena, Italy. “Tremendously powerful.” – Col. Roxanne Cheney, Commanding Officer, MCAS Beaufort, SC. 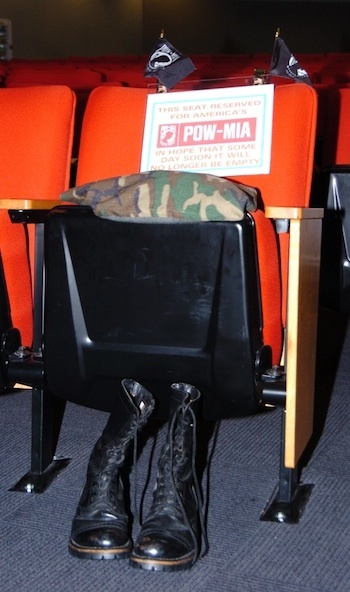 The front row center seat at every performance of Letters From The Front is reserved for our POW & MIA. These boots were given to us by a Vietnam Vet who had suffered from PTSD since he returned home. He told us that these had been his boots and he wanted them to travel with the show to remind people to never forget our POW and MIA. We never have and never will forget. 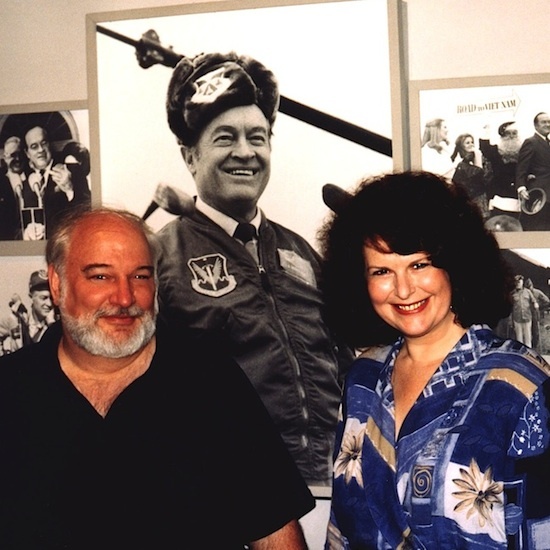 Playwright/Director Robert Rector & Producer Marsha Roberts carry on a long tradition of entertaining the troops. Photo taken at Bob Hope Performing Arts Center at Lackland AFB, TX. 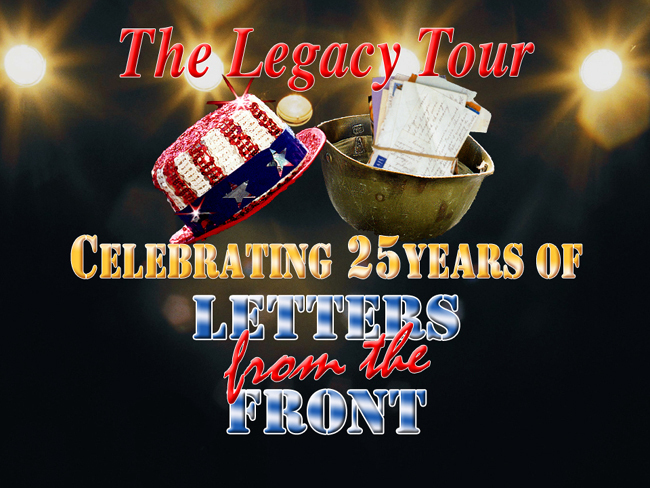 Letters From The Front recently had a revival engagement and it was so well received that we are now working on a new national tour. Check back with this site to see the progress and to find out where we’ll be playing. Chances are we’ll be playing at a base or town near you. Please feel free to comment here or to contact us. We will need your support so that we can support those who have served us – on the home front and the battle front. One final note: Our show is brought to military communities free of charge through the support of corporate sponsors who enthusiastically support America’s Armed Forces and use our show as a way of showing their appreciation. 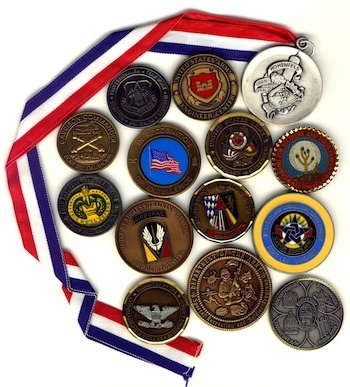 Tags: Air Force, Airmen, American Troops, Army, Desert Storm Vets, Entertainment, Healing, Iraqi Freedom Vets, Letters From The Front, Marines, Military Family, Navy, Never Forget, Remember Everyone Deployed, Sailors, Service Members, Soldiers, Support Our Troops, Theater, US Military, Veterans, Vietnam Vets, WWII Vets | Permalink. Why did LETTERS FROM THE FRONT become so beloved by audiences around the world, both military and civilian? What makes it so unique? Stars Kathleen Hogan & Tim Ross receive a standing-O at a recent performance. Kimball Williams belts out a rousing rendition of the National Anthem on opening night. 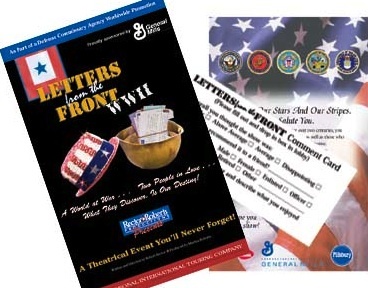 Perhaps it’s because this 3-act dramedy is the only play in which actual war correspondence written by soldiers and their loved ones throughout American history are interwoven into a story that takes place on the home front and honestly reflects the personal themes found in the letters themselves. It’s about the commitment to preserve freedom, from Valley Forge to now. It’s a story that’s as relevant today as it was when it first opened 25 years ago. LETTERS FROM THE FRONT is entertaiment with a mission. Katharine Hartgrove, played to perfection by Kathleen Hogan, is a popular writer of human interest stories. She’s also a war mom. Her son Stuart is fighting in Northern Italy during the final days of the war in Europe. Katharine goes all-out to support the war effort. She has a night job at the submarine plant in nearby Groton, CT building torpedo tubes. She even donates her tires to the rubber drive and now must rely on public transportation to get around. She’s also been commissioned to write a play based on actual war correspondence going back as far as the Revolutionary War. Since Katharine has never written anything to be performed before she enlists the aid of her boyfriend Johnny Chastain, played hilariously by Tim Ross. Johnny is America’s favorite radio comic, known as “Mr. Entertainer.” Katharine refers to him as “that two-legged typhoon with way too many hands.” Johnny is only too happy to assist Katharine – anyway he can. To say the two have very different visions of how the war letters should be presented is the understatement of the year. Johnny sees them as source material for a flag-waving patriotic pageant. Katharine sees them as meaningful and to a degree sacred; a gateway to the human spirit. 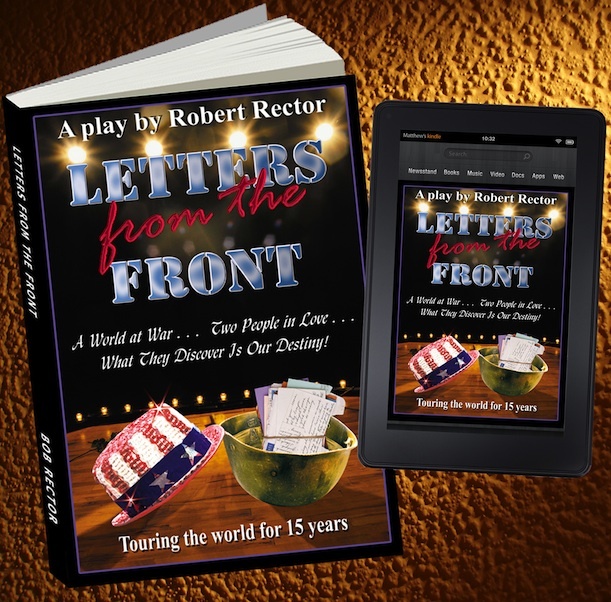 Letters From The Front is a unique blend of live theatre, original music as well as popular music from the era. There are also hundreds of images that illustrate the different war letters as they are being read. Other images reveal Katharine and Johnny’s lives prior to the events shown on stage. Considerable time and effort, as well as photographic magic, was required to create these images, including shots of Katharine when she was a young flapper during the 20’s, her cover photo for Life, even a shot of Katharine and Johnny caught off-guard while on his sailboat. Why go to all this effort? It’s all in an attempt to capture the times during which the play takes place and provide a more immersive experience for the audience. We don’t want them to just watch Letters From The Front, we want them to experience it. According to the comments we’ve gotten, we seem to have accomplished our goal. Tuskeegee Airman Val Archer is greeted by Producer Marsha Roberts. THE MUCH-HERALDED TUSKEEGEE AIRMEN FLEW RIGHT OUT OF THE PAGES OF HISTORY AND INTO THE HEARTS OF THE AUDIENCE AT A SPECIAL PERFORMANCE OF “THE WORLD’S MOST DECORATED PLAY, LETTERS FROM THE FRONT” IN THEIR HONOR ON NOV. 8. Val Archer, born in 1929, enlisted into the Army Air Corps at the early age of 15 out of a strong sense of patriotism and love of country. He served with the Tuskegee Airmen as an instrument specialist on P-47s and C-47s. He saw active duty in Korea, Japan, Guam, the Marshall Islands and Europe. He was presented the Congressional Gold Medal on March 27, 2007 by President George W. Bush. (Left) Tuskeegee Airment Val Archer receives a Standing-O from the audience. (Right) Kathleen Hogan, star of Letters From The Front, gives Val Archer a big hug after the show. Left) Kathleen Hogan and Val Archer are joined by Annie Taylor, GA State Madam of the Fraternal Order Of Eagles. 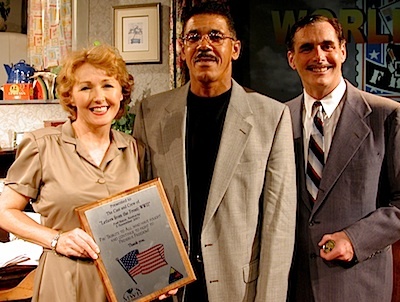 (Right) Stars Kathleen Hogan & Tim Ross share accolades with Producer Marsha Roberts and Playwright/Director Robert Rector on opening night. Sparkle Adams (right) City Councilwoman from Forest Park, Ga is joined by artist Gilbert Young who created a special edition of his famous painting “He Ain’t Heavy” honoring America’s Veterans. He also founded Elevating Veterans Through Art. Many groups and individuals worked together to create this special event honoring the Tuskeegee Airmen. Among them were the Atlanta Chapter Tuskeegee Airmen, Inc., the Fraternal Order Of Eagles, and Elevating Veterans Through Art. Stars Kathleen Hogan and Tim Ross gave a stirring performance of Letters From The Front and were rewarded with enthusiastic applause and a Standing-O. A reception followed organized by Kimball Williams, also of the Fraternal Order Of Eagles. It was a memorable afternoon for all involved. 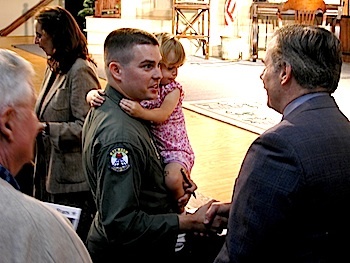 It is gratifying to have the military respond to us with such warmth, kindness, and encouragement. After the show we often receive standing ovations and are presented with Commander Coins, plaques, certificates of achievement, and other awards. These now number in the hundreds and we are proud of each and every one. We are very excited to announce that Kathleen Hogan has been chosen to play the indomitable but big-hearted Katharine Hartgrove in Letters From The Front opening at the Theatre In The Square in trendy Marietta, GA on Nov. 4, 2015. She will be joined by Tim Ross as manic wild man Johnny Chastain, America’s favorite radio comic. Kathleen has worked extensively on New York and regional stages playing a diversity of roles from Lady Macbeth to Truvy in Steel Magnolias. She has also appeared in a number of movies and TV shows and was directed by Robert Redford for his film The Conspirator, playing the role of Mrs. Mountchessington. Tim also has a long resume of stage and film work – including the popular TV soap Days Of Our Lives. His lead roles on TV include Saved By The Bell and The Mecklenburgers. On stage he has appeared as Tybalt in Romeo And Juliet and Joe Farkus in The Last Night Of Ballyhoo. 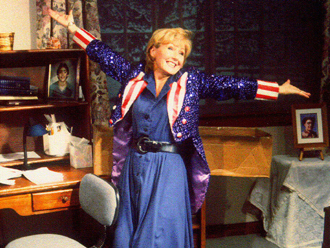 Kathleen Hogan will be the 7th actress to slip into the fabled “Aunty Sam” jacket since the show first opened in 1991. Yes, the same jacket has been used in every performance of Letters From The Front and has travelled all across America including Alaska. It also dazzled audiences in England, Germany, Italy, Spain, Belgium, S. Korea, Japan (including Okinawa), Diego Garcia (in the Indian Ocean), Guam and Kwajalein in the Pacific Rim. The fact that the jacket still looks great is a testament to how well it was crafted. It is covered in thousands of hand-sewn sequins, most of which still remain. The history of the jacket goes back even further than Letters From The Front. In 1989 we were contracted to do a 15 minute promotional film for Revlon’s military sales division. It was a comedy spoof of makeup make-overs aimed at women in the military – in uniform and not. 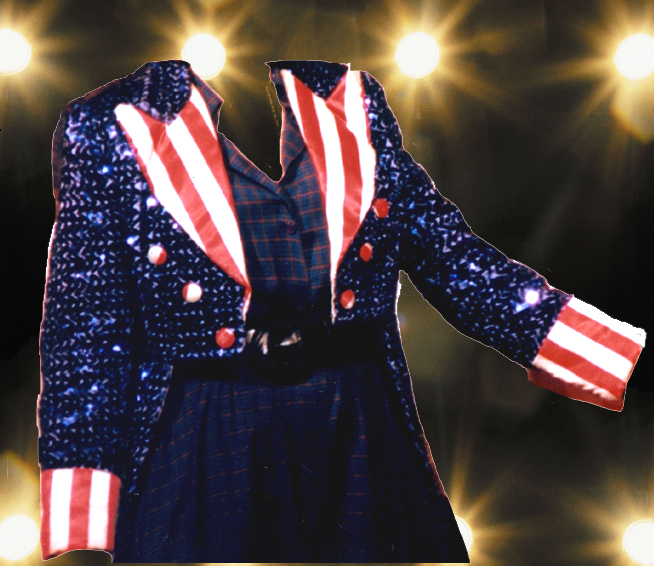 The central character was a stylish Aunty Sam and the jacket was purchased for her character – one of the most expensive items in the film. The actress who played Aunty Sam was – you guessed it – Della Cole, two years before she originated the role of Katharine Hartgrove in Letters From The Front. 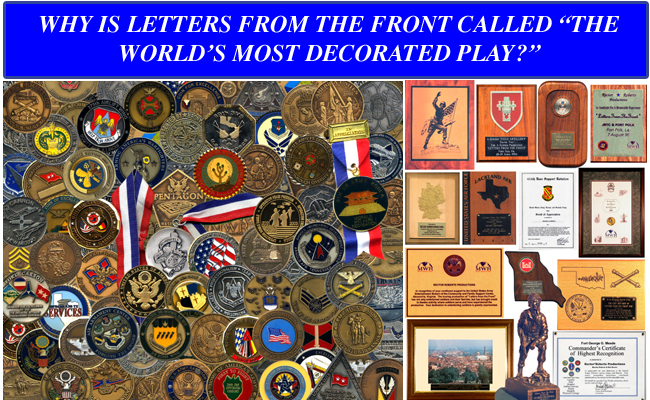 Also known as “the world’s most decorated play, Letters From The Front is a “patriotic tribute to the men and women who so bravely serve” (Gretchen Carlson, CBS News). 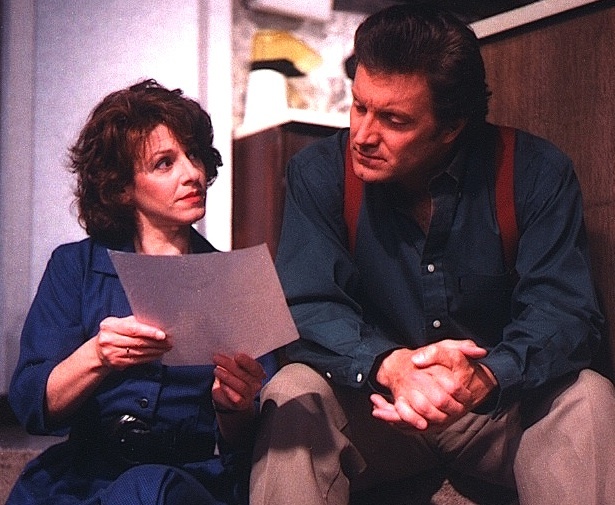 Twenty-five years ago my wife and business partner Marsha Roberts and I had a crazy idea: “Lets do a play!” We already had two decades experience making films, videos and live “corporate theater” presentations for the likes of Coca-Cola, IBM and Revlon and we had just finished a ninety minute, three-act, seven character extravaganza for Georgia Pacific. We decided that producing a legitimate play was only a step away. We took the step. 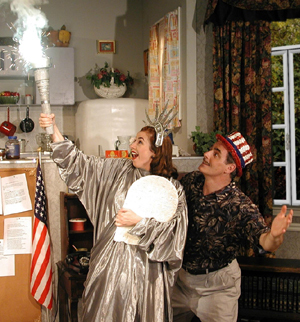 We knocked around several ideas; I was favoring a musical comedy, but on the night of Sept. 13, 1990 Marsha had a dream. This story has been told many times over the years until it has reached legendary status, but it is absolutely true. In her dream Marsha saw a theater marquee emblazoned with the words Letters From The Front in neon. When she woke up she told me about it then said I had to write a play to go with it. For even greater motivation, she booked the non-existent play into Atlanta’s 14th Street Playhouse for a three week run starting March 6 – less than six months away. Simple. Bear in mind that I had no idea what this play was going to be about. Eventually I developed a storyline centered around Katharine Hartgrove, a renowned writer of human interest stories who has a son in the Army who’s just been deployed to the Middle East. She writes many letters to him and it occurs to her that this process has been going on throughout American history and decides to create a play based on real war letters. 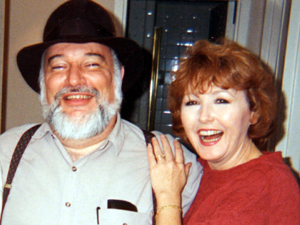 She enlists her boyfriend Johnny Chastain, a comic showbiz veteran, to help her. Operation Desert Shield was just getting under way when work on the play began. My script wasn’t centered around Desert Storm because Desert Storm didn’t exist. At the time everybody expected Saddam Hussein to back down. That changed on January 17. We were at war with Iraq. Since ours was a contemporary play, each night after watching the news I would write new pages to reflect what was happening. Rehearsals started Feb 11 and I was still doing nightly rewrites. When the war ended on Feb. 28, we only had five days of rehearsal left before opening night and I still hadn’t written the ending yet. Della Cole, the original and definitive Katharine Hartgrove. Despite the last minute pandemonium, Letters From The Front opened on March 6, 1991 with Della Cole in the role of Katharine Hartgrove. This wasn’t by sheer chance. I wrote the script with her in mind. Why? I needed an ace in the hole. I had worked with Della on a number of film and live shows and knew she was a powerful performer able to tackle any character. Audiences loved her and she and I had a great working relationship. In a film we did together for Revlon she played Aunty Sam and wore a sequined top coat and hat. We held onto that costume and used it in Letters From The Front as part of a comedy take-off on overblown patriotic pageants (see pix above). 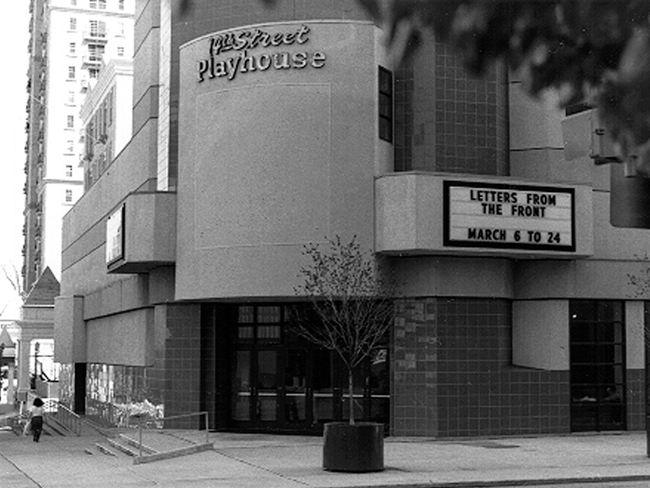 By the time we finished our 14th Street Playhouse run we knew we had something special but we also knew changes needed to be made. 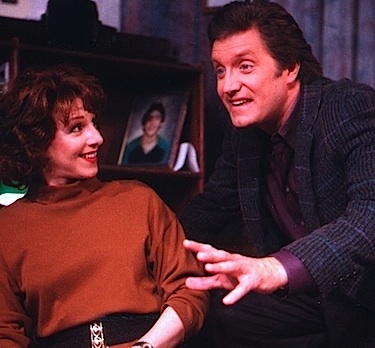 I shortened the play by thirty minutes, eliminated extraneous plot lines, and moved the locale from Johnny’s cold NYC flat to Katharine’s homey Connecticut bungalow. 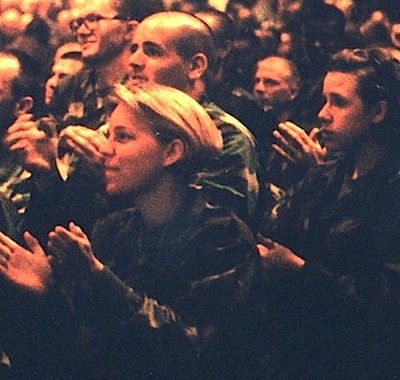 But the most important development during the initial run was that after every performance military families would tell us how our play really told their story and should be toured to military bases across the country. That never occurred to us and when I wrote the play I didn’t do so with a military audience in mind – a very happy coincidence. 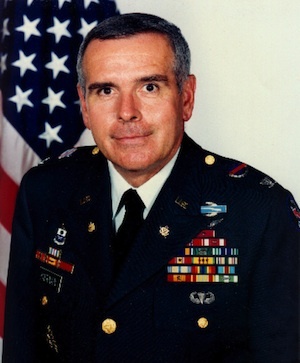 As producer, Marsha was invited to the Pentagon by Col. Rick Kiernan who was in charge of Army Public Affairs. He loved the idea of the show and threw his support behind it. Meanwhile I was in Atlanta reshaping the show. After going down many dead-end roads Marsha finally got a green-light for a test engagement at Ft. Bliss’ Center Theater in El Paso, TX, December 10 & 11, 1991. The shows were enthusiastically received with standing-Os both nights. 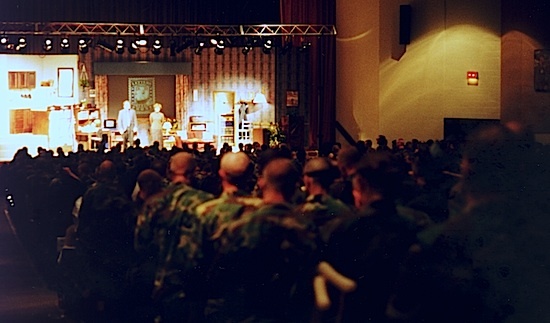 Our first full military base tour was scheduled to begin in June ’92 at Keesler AFB in Biloxi, MS. 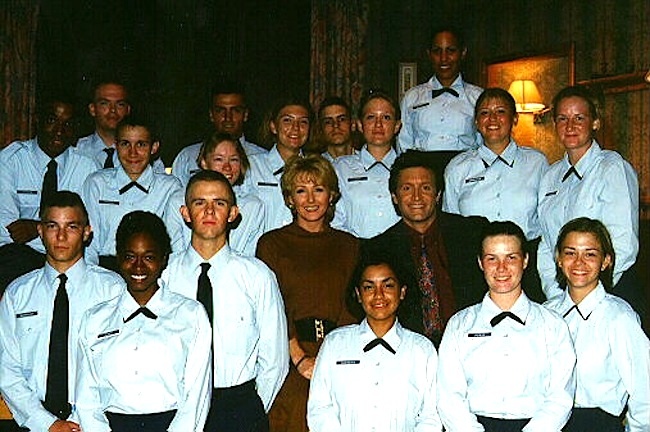 Playing before military community audiences was very special for all of us on the show. I was personally gratified and touched that so many people, especially military wives and moms, came up to me after a show and thanked me for telling their story. The stars always participated in a meet-and-greet in front of the stage after final curtain. This included troop shows, our favorites. There were always plenty of hugs, handshakes and autographs. We all marveled at how warm and friendly everybody on military bases were. They made us a part of their family and we loved it. and sound system would be compatible no matter where we played. It could also output either a 50 or 60 Hz frequency. Our motto was: give us four walls and some seats and we’ll do everything else. 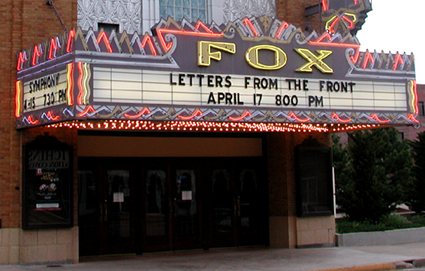 Letters From The Front is probably the world’s most self-contained touring show. We’ve performed in England, Germany, Belgium, Italy, Spain, S. Korea, Japan (including Okinawa), Guam, Diego Garcia and Kwajalein. 1997 also saw Neal Matthews take over the role of Johnny Chastain. He continued playing Johhny in both stateside and overseas tours through the 1999 Pacific Rim Tour. He played opposite Della Cole in the ’97 tour and again in the ’99 tour. In between, his costars were Danette Bock and Michelle Rosen. Della also directed the 2001 tour, the only other person I’ve trusted to do the job. The ’99 Pacific Rim tour also saw a major change in the show itself. Instead of taking place during Desert Storm, it now took place during World War II – same characters, same story, different era. Audiences loved the new version and we’ve performed it exclusively ever since. 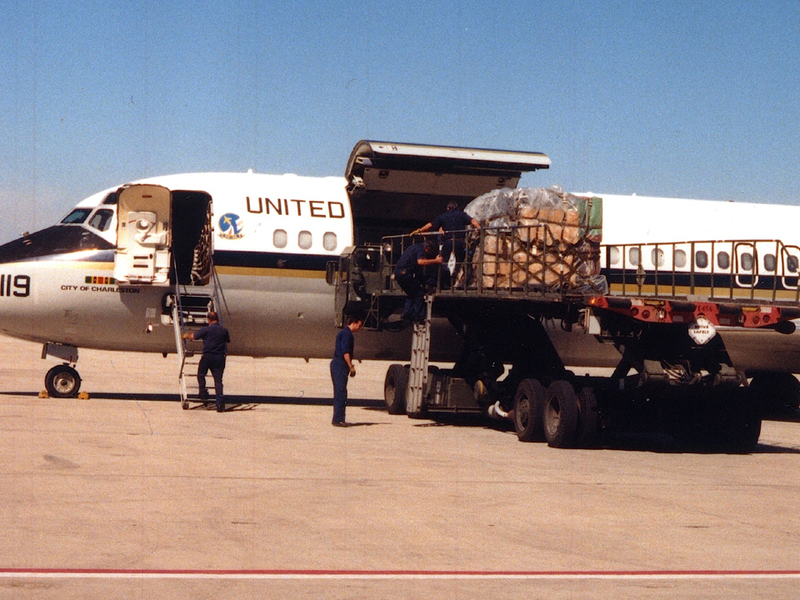 9/ll brought about major logistical changes for us. 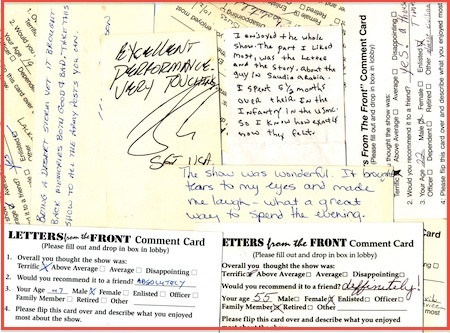 We were determined to keep touring and the bases wanted us to keep performing for military community audiences because our show was considered a morale booster and thus beneficial, but because of the war, support units were stretched thin. We understood and figured out ways to keep the show on the road without being a burden to our friends in Services. Bob Curren and Bobbi Kravis became the new Katharine and Johnny and were audience favorites for years to come. We ended the 2005 tour being chased out of Louisiana by Hurricane Katrina. Loading out of our last show at Ft. Polk became a hazardous exercise due to the heavy winds and our set sustained some damage. We hit the road early the next morning and made it as far as Birmingham, AL where we were safe. It was like a premonition. It was time for Letters From The Front to go on leave for a while. 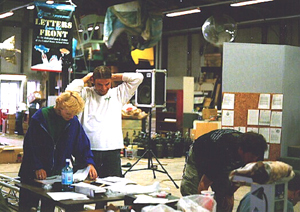 After 15 years of being set up and taken down then packed onto trucks, planes and ferries hundreds of times all over the world, the show was physically exhausted. So were we. Now a new era is starting for Letters From The Front. 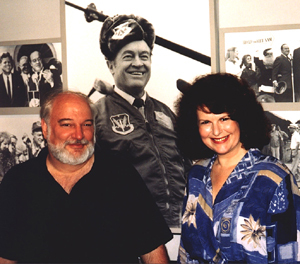 Marsha and I are determined to continue the legacy we started 25 years ago, following in the footsteps of Bob Hope by entertaining and inspiring our troops and their loved ones throughout the world.